These are all great suggestions, but many of the problems are even more basic. 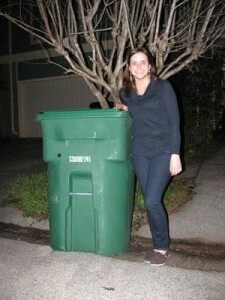 Despite the big green bins for single-stream recycling being available in parts of the city for four or five years and proven effective at increasing recycling, we STILL have not rolled them out to everyone, even neighborhoods like mine in the Heights that has literally been begging the city for them for years. Yet if you try to get a new bin for dual stream recycling, the city does not have any more “because we are moving to the big green bins.” And in the meantime, the city is selling off plots of land that used to house convenient neighborhood recycling drop-offs (aka Center Street center in the Heights), making everyone without a big green bin drive to the dump and stand in line with a utility bill to drop off glass recycling. If the city cares about the recycling rate, they have a strange way of showing it. A couple of weeks ago when my husband was working from home on recycling day, he went out to check the mail just in time for the recycling truck to pull up and had an interesting conversation with the driver. Seems we put out “too much” and need to “put some in the regular trash”. We’re talking paper, cardboard & steel/aluminum cans. According to the driver, we’re restricted to 3 bins of recycling and, in addition, not only have to break down the boxes, but tie them up with cotton string in bundles no more than 6″ high. This is Inwood Forest, to which we’ve recently moved – no wonder we’re only one of 6 people on the block who bother with recycling! People lucky enough to have the big, green bins say they are great, but it is too bad that the City is closing drop-off locations to fund the expansion of curbside recycling. I wonder if they could have found ways to keep the drop-offs and fund curbside recycling expansion by cutting back on corporate subsidies for example. The little 18-gallon bins make no sense. Houses produce more than 18-gallons of recycling every two weeks and the big bins are much easier to use. The Mayor promised to expand the big, green recycling bins to every household before the end of her term, so she deserves praise for that. More folks will put them out once they have the big, green bins and the City puts a little more effort into education and promoting the program. I live within the city limits, and I’ve been recycling for 25 years. I’ve never had any kind of curbside pickup. I filled my car with my recycling and drove it to Bellaire or Missouri City, because they were closer to me than any of the Houston centers. I’ve been forced to drive to the Westpark center since Bellaire closed their drop-off center a few years ago. I can’t see how the city can complain about the low recycling rate when they make it so hard for so many people. I spend time and money to keep two households from throwing away a majority of their trash, and it’s infuriating that people a mile away from me can just put theirs out on the curb and have it taken care of. Echoing Lauren and Melanie’s comments above, the city talks about extending recycling to all homeowners, but there is a big asterisk attached. Single stream is only available for conventional neighborhoods, and is not currently available to gated (townhome) communities or apartments. This is ridiculous, particularly as the density inside the Loop is increasing. It makes zero sense that the city will gladly pick up my 18-gallon recycling bins, but will not extend the single-stream program to me because I am in a gated community. If the city truly wants to make recycling a priority, then as mentioned above, it needs to have a consistent program and rollout the program to everyone. The City doesn’t pick up bins from within gated communities, that pickup is done by the HOA or other party. Get them to do the recycling, since you are paying them to pick up your trash. The City rebates the solid waste fees included in property taxes to communities that take care of their own trash.